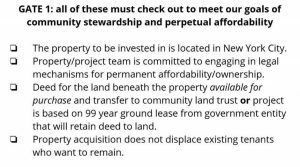 We are at a point in the NYC REIC’s trajectory where we are actively considering investment projects, thinking about fundraising, and generally deciding what the NYC REIC is going to look like in the near future. To make sure the NYC REIC develops intentionally and with member input, the Founding Board is hosting a facilitated organizational planning session. If you are interested in attending, please RSVP here by February 27, 2017. As this will be a sequential, facilitated meeting, please commit to attending the full four-hour session. After you RSVP, a facilitator will be in touch with you by email with more information. CHECK IF YOUR PROPERTY CLEARS GATE #1 OF OUR VETTING PROCESS! We would like to express our thanks to MoMA PS1 for their generosity in hosting our meeting! We had a good turn-out of member-investors, both old and new – thank you for joining us! 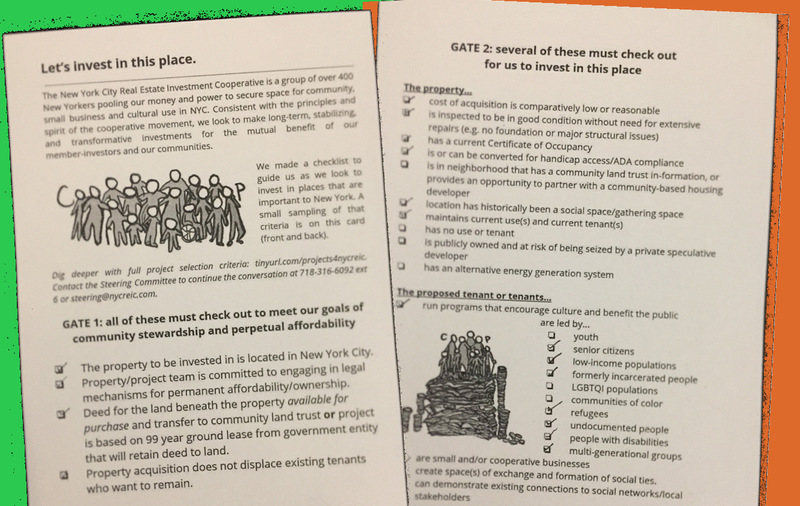 The agenda centered around an update on where the Founding Board stands now in achieving the aims of the REIC, with a review of our adopted Bylaws, and a presentation on a potential first collaboration project by Nat Roe, Executive Director, Flux Factory, in LIC. 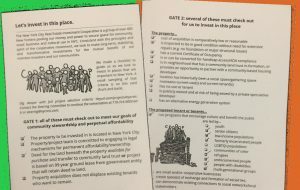 After an interactive game of “Let’s Invest in This Place,” using real potential projects, we looked at our next steps, as well as a glimpse of the direction our branding design is taking, and a shout-out of upcoming meetings and ways to join us in our work. We are incorporated! The NY Department of State has accepted the certificate of incorporation for our Not-For-Profit Corporation that houses our cooperative. Since then, the Founding Board (made up of the Steering Committee members) has finalized and approved the initial set of Bylaws, which now govern the operations of the Not-For-Profit Corporation. 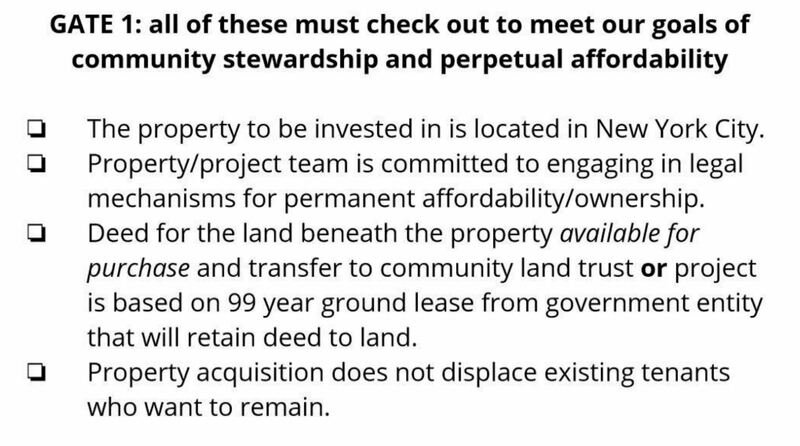 The Founding Board decided, after discussing with our lawyers at the Fordham’s Community Economic Development Clinic, to adopt the initial set of Bylaws to ensure that we are bound by the rules we’ve designed for ourselves (rather than be bound by the default rules of NYS laws). From this point on, however, you the membership are in charge of the rules of the cooperative, and any amendment to them must be approved by members at a properly called meeting. We are now finalizing the letter to send to the NY State Real Estate Finance Bureau, which will allow us to start raising capital for our first project(s); registering with the NYS Charities’ Bureau; and filing for our tax-exempt status (we currently receive tax exempt charitable treatment through an agreement with our fiscal sponsor, Spaceworks NYC). We are focusing on building the limited liability company (LLC) that will invest in projects for us, and a framework to guide how we approach the communities and the proponents of future projects! We invite you to help with vetting potential projects in your own communities! We are in the final phases of creating a new graphic identity for the REIC, with huge thanks to Roy Rub and Seth Labenz of Topos Graphics for their pro bono work! We presented the two directions we are looking at, at the All-Member Meeting – and will be asking for your feedback soon! Please post to the REIC blog! Contact Leland at leland.cheuk@gmail.com to post on a topic specific to your workgroup or anything else related to the REIC. Please contact Mark Read at newsletter@nycreic.com to join the Newsletter Team! Please keep an eye out for an upcoming screening event in March! REIC U is the committee of the REIC that creates educational programming for our membership and the public. See the info on our joint meeting with CORB on February 26th. See the info on our joint meeting with REIC U on February 26th.